Votes were taken from the Man of The Man awards and combined the votes taken at the end of the season when we asked people to vote for their Player of the Year. Callum Woods was by way far ahead of everybody else and so he was presented with the Internet Fans Young Player of the Year. The Player of the Year was more hotly contested, Souleymane Bamba Stevie Crawford and Paul Gallacher. 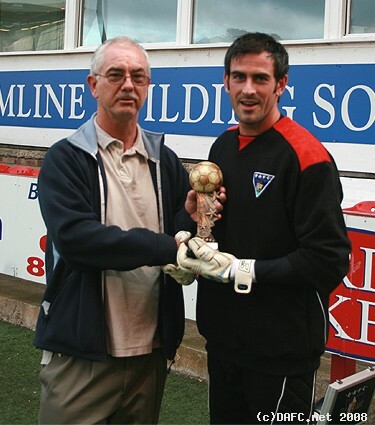 The outcome was that Paul Gallacher had the most votes. As the voting is done after the season ends we often present the trophies at the start of the new season (friendlies). 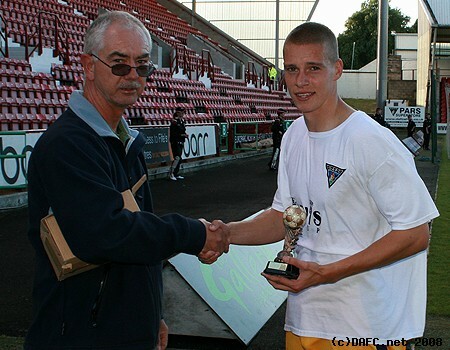 Callum`s trophy was presented prior to the Hearts friendly. I missed Paul coming off the field before the Hearts game so presented it to him before the Dundee United game.